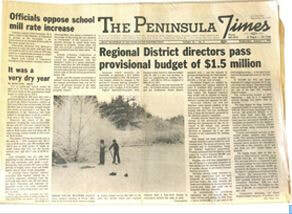 Explore the archived collection of THE COAST NEWS and THE PENINSULA TIMES online! The newspaper digitization project is an initiative of the Sunshine Coast Museum and Archives. We are working to provide free digital access to newspapers of the Sunshine Coast, British Columbia. Thanks to funding from the Irving K. Barber Learning Centre, the Coast News/ Sunshine Coast News and Peninsula Times newspapers can be viewed online and are freely accessible to the public. For this first phase of the project, we focused on issues of the Coast News in most urgent need of preservation (1945-1976, 1983-1987, 1989). These were digitized and uploaded to the BC Historical Newspapers database in August, 2012. The second phase of the project saw the entire run of the Peninsula Times (1963-1979) added to the database on Monday, January 6th, 2014. The final phase, completed in March 2014, saw the addition of the remaining issues of the Coast News (1978-1982, 1988, 1990-1995). The archived newspaper collection provides a valuable historical reference for understanding individual lives as well as broader community issues on the Sunshine Coast. The collection spans 50 years of community history during a period of tremendous growth and development. Stories about individual lives and specific events provide valuable information that is not recorded in more formal historical accounts. Editorials and articles provide perspective on opinions and views of the times. Few other sources of historical information are as prolific and as wide-ranging, or offer such a detailed lens into our community’s past. With the support of the UBC Digital Initiatives team, the publications have been digitized and uploaded to the BC Historical Newspapers website. Each issues is searchable using keywords or dates; single pages can be downloaded in JPEG format; and entire issues can be downloaded as PDF files. This important project not only protects these archival treasures in digital form, but provides public access to this valuable resource. Now you can easily explore the sometimes familiar and often surprising details of our not-so-distant past. A warning: Be sure to let someone know your whereabouts before perusing the past - it's easy to lose track of time!